Flavorful, moist meatballs bathed in a tart yet sweet cranberry sauce for a savory contrast. A recent trip to the grocery store turned out to be both a blessing and a curse. Whole chicken was yet again on sale for rock bottom prices, so I dragged James out as additional muscle to find the largest ones we could and had him haul it back home. I was excited about the idea of cutting up the chicken and putting my meat grinder to work, but the cutting was bitterly long work. Yet born from this was a bounty of ground meat for a fun and quick meatball recipe. Cooking these cranberry glazed meatballs took much less time than expected. The meatballs turned out moist and flavorful - and the cranberry sauce gave it a Thanksgiving feel in the middle of this chilly March. You could also use ground turkey for more a "Thanksgiving-like" experience. :) While I might not recommend hacking up a whole chicken for fresh ground meat if you don't have the time, I would recommend this recipe. Give it a try and enjoy! Do you usually buy a whole chicken or pre-cut? What's the most efficient way to cut up/debone a chicken? Combine all materials except cranberry sauce. Form meatballs about an inch in diameter. Bake at 375F for 15 minutes, until cooked through. yummy! Those look really tasty. Thanks for linking up to Tasteful Tuesdays! you are a faithful linker! love it! Really appreciate you stopping by my blog! I’m trying to keep in better touch with my linkers/readers… If you already follow me, please let me know I will find your blog on Bloglovin (I’m transferring my follows there)if you don’t follow in any way, would you consider following via GFC or other method? I confess I don't make meatballs very often, but my family LOVES them. These look easy and quick! I always like seeing the recipes linked on Tasteful Tuesdays. :) I follow via RSS and I think FB/Twitter. Thanks for stopping by, Emily! These look great! Thanks for sharing at Show Me Your Plaid Monday's! So these would be GREAT for a party! I love that you used chicken, too. Thanks for sharing at Pinworthy Projects. 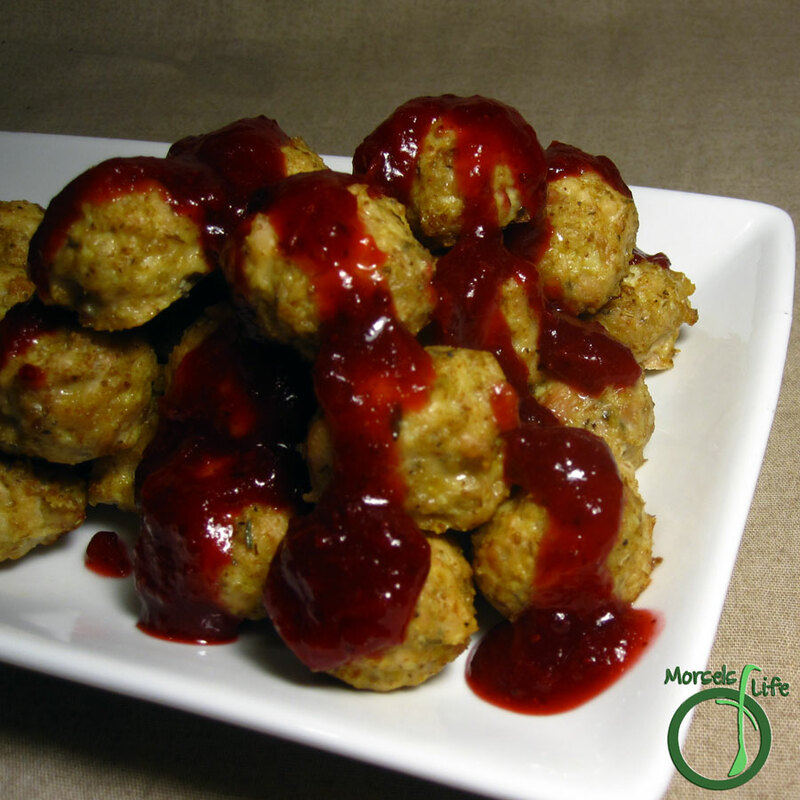 What a great idea, both using chicken for the meatballs and then topping with Cranberry sauce. This is one I will have to try. I bet it'd work great with turkey too - kinda like a Thanksgiving meatball. :) Let me know what you think once you get to give it a try! I have never used ground chicken, but what a wonderful alternative to a meatball! Would love to try your recipe. Pinning to share. Thank you for taking the time to share your recipe with us at Snickerdoodle Sunday! Have an excellent week! I just pinned this to my meatballs board. I cannot wait to try it! Thanks! I agree! Sometimes I get tired of eating meat balls made from the same meat, and these meatballs are a great way to switch it up. :) The cranberry sauce does provide a wonderful contrast too! What a neat recipe for the holiday season! Yum!!! You will be the hosts' feature this week on Simple Saturdays Blog Hop! I can't wait to see what you share this week! These meatballs sound so good, love the addition of cranberry sauce on top! Thanks for sharing at What'd You Do This Weekend?! It really gives these meatballs that extra zing. :) Also a great way to use up leftover cranberry sauce! Who doesn't like meatballs? Great recipe - Thanks for sharing on the What's for Dinner link up. Those look amazing! They remind me of the meatballs that my family has been making for generations! Ours is a Swedish meatball with Lingonberry jam. I imagine it would be similar. That savory/berry combo is to die for!